The vibrant passion-vine butterfly species Heliconius erato doesn’t taste as good as it looks. The flesh of this South and Central American species accumulates toxic compounds to discourage would-be predators, who quickly learn to associate the butterflies’ unpleasant taste with their bold red warning colors and patterns. But H. erato isn’t the only species that wears this particular danger sign. Another foul-tasting relative, H. melpomene, has evolved an almost identical set of markings. In fact, even though the wing patterns of H. erato vary across its geographic range — from red-banded to red-rayed to so-called “postman” marks — this variation is mirrored nearly everywhere by matching patterns of H. melpomene. In other words, each species looks different in different places, but wherever their ranges overlap, the two species mimic one another. For more than a century, biologists have used Heliconius as a model of mimicry, an adaptation that has been observed in not only insects, but also fish, reptiles, amphibians, and perhaps birds. Across the Heliconius genus, mimicry is remarkably prevalent, including large coalitions of Heliconius species that live alongside assorted unrelated butterflies and day-flying moths that have all converged on a single warning pattern. In the June issue of GENETICS, Kronforst and Papa review the genetics of wing patterning in Heliconius, charting how rapidly-expanding genomic knowledge of the system promises to provide insights into some of the oldest questions about adaptive processes. Approximate distributions of the three major phenotypes and locations of many subspecies of co-mimics H. erato and H. melpomene. Matching wing-color-pattern variation and subspecies names are shown below the maps. At each location (numbered) the local sub-species of H. erato and H. melpomene show similar wing color patterns. Common themes among these patterns allow them to be grouped into three general categories: red-banded (1-8), rayed (9-16), and “postman” (17-21). (Two incipient species that are part of the H. erato radiation, H. himera and H. erato chestertoni, are also indicated). The first biologist to explain how mimicry might evolve was explorer-naturalist Henry Walter Bates. Inspired by data collected on an epic expedition to the Amazon with his friend Alfred Russel Wallace, Bates’ 1862 proposal was one of the first applications of the radical new theory developed by Wallace and Charles Darwin — evolution by natural selection. In his butterfly surveys, Bates noticed that palatable and unpalatable species sometimes shared nearly identical warning patterns. He reasoned that the more delicious varieties gained a selective advantage by mimicking the patterns used by the unpleasant tasting species. This type of mimicry is now known as Batesian. But what about when both species are unpalatable, like H. erato and H. melpomene? Why should either species bother to mimic another bad-tasting bug when it has its own chemical defenses? The explanation was provided in 1878 by Fritz Müller, another Amazon butterfly-catcher inspired by the ideas of Darwin and Wallace. He argued it came down to the cost of training the predators to recognize which wing patterns were off the menu. When näive birds try to eat a unappetizing butterfly, they will steer clear of similar looking bugs in the future — but the encounter may well be fatal for the taste-tested butterfly. By sharing the same warning pattern, the two Heliconius species speed the process of predator learning, and divide the risk of being eaten. It’s a case of strength in numbers that increases each individual’s chance of survival. Fritz Müller was a German naturalist who lived for 45 years in Brazil. Inspired by his observations of Brazillian butteflies, he was the first to explain how an unpalatable species might gain an advantage from mimicking another unpalatable species. His argument was also one of the first examples of using mathematical arguments to support an evolutionary explanation. Because this type of mimicry—known as Müllerian— is so widespread in Heliconius, the group has become the primary model for understanding the phenomenon. The power of this model has rapidly expanded in recent years, thanks to a co-ordinated international effort to understand the genetics of its wing patterning. These efforts have identified a number of mimicry loci that control similar aspects of wing patterns in different species. For example, across all Heliconius species the optix gene is critical for specifying red coloration, while WntA specifies black patterning. Along with the assembly of the H. melpomene genome, these molecular details are giving rise to a number of evolutionary insights. For example, it has become clear that mimicry in Heliconius evolves by several mechanisms. In some cases, similar wing patterns independently evolve in co-mimicking species through different mutations in the same genes. In other cases, the two species directly exchanged adaptive variants via interbreeding. Kronforst and Papa illustrate a number of other ways that genetic discoveries are helping reveal the mechanisms of mimicry and shedding light on more general questions in evolutionary biology. 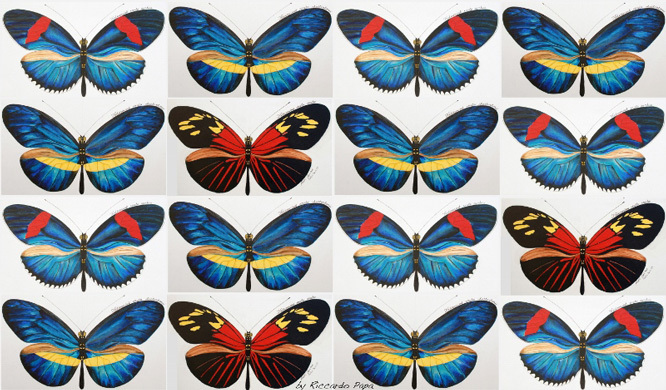 In the age of genomics, we can now trace the molecular details of evolutionary processes that Müller and other pioneers could only infer from the pretty colors traced on butterfly wings. Kronforst, M. R., & Papa, R. (2015). The Functional Basis of Wing Patterning in Heliconius Butterflies: The Molecules Behind Mimicry.